Best Exercises for Seniors to Do at Home - Pro Fitness Guide! No matter whether you are at your sixteen or sixty, an active lifestyle is second to none when it comes to staying fit and healthy. For seniors, it’s way more important to maintain a daily exercise routine if you want to stay healthier. Regular exercise, along with improving balance and flexibility, can contribute to a great extent to prevent cardiovascular diseases, diabetes, and fight several forms of cancer as well. If you are one of those senior fitness enthusiasts planning to get started with your daily fitness routine, this post is exclusively for you. In this particular post, we are going to share some most effective exercises for seniors to do at home with or without the help of a senior home care provider. Let’s get started in the following without delay! To start with, you can simply try wall pushups, one of the popular exercises for older adults. This particular form of exercise works to strengthen the chest and shoulders. And, you can avail the health benefits without burning much of your calorie with this workout. Repeat 10 to 15 times and there you go! It’s another easy yet effective strength training workout for adults. Toe lifts help to improve balance and take care of the muscles too. To perform this particular exercise, you will need a support, a counter or chair will do fine, we guess. Repeat 15 to 20 times and there you go! It’s one of the most useful stretches for the lower portion of your body. Lower body stretch helps to tone the calf muscles and hamstring as well. Like the earlier one, you will need a support to perform this particular exercise, a counter or chair will do fine, we guess. Repeat the entire process 10 to 15 times and there you go! Like lower body stretch, upper body stretch is also very important to increase flexibility. It’s kind of easy to do exercise and can provide you with the maximum benefit of your daily workouts. Repeat the process 5 to 10 times and there you go! It’s a great stretch for both the young and the adults. This particular stretch works like magic to relieve tension in the upper back and the shoulders. Now, relax your shoulders and reach your fingertips out until you feel a stretch. Hold in that position for 10 to 20 seconds and get back to the previous position. Repeat 5 to 10 times and there you go! 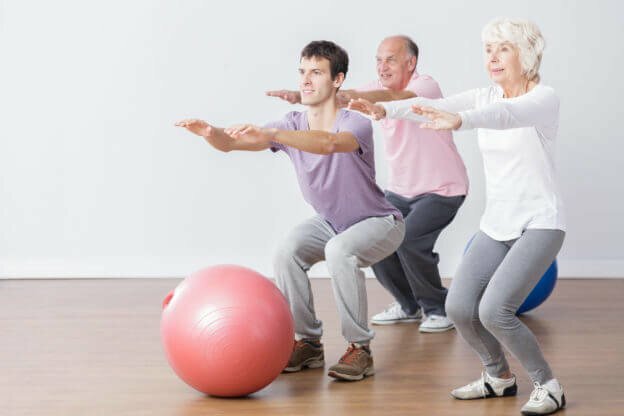 While we are going to conclude this post for today, we expect that you read between the lines and came to know of some most effective daily workout forms for seniors. Now, it’s your turn to get started with these exercises and stick to your daily goals. Hope you found the post helpful and enjoyed reading!